Apple's AirPort Express and AirPort Extreme aren't the most customizable routers out there, but they're dead simple to set up, and are generally very well regarded. Apple Wireless Network Gear (Refurbished). Multiple Routers Available from $69.99–$159.99. So, in water polo, do the horses have to know how to swim? Jawbone JAMBOX Wireless Bluetooth Speaker With Color Option | eBay! The 3D Everything is Awesome Edition that includes a mini fig is also available for $35. Need some new luggage for your summer vacation plans? Here are some sales on Tumi and Samsonite bags, plus a set of packing cubes to keep your suitcase organized. Want all of your deals in one place? 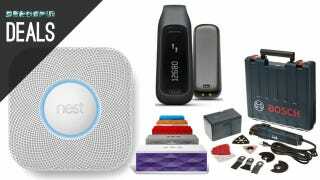 Check out today's edition of Kinja Deals.